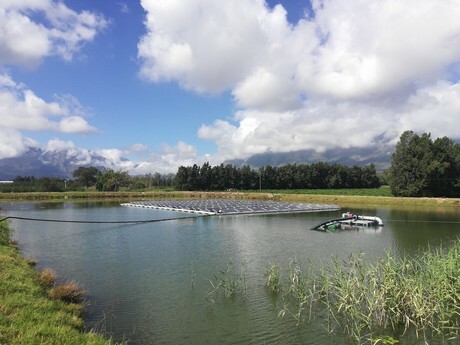 Marlenique, a fruit farm and wedding venue just outside of Franschhoek has unveiled a state of the art, floating solar PV system. The system has been installed by New South Energy on the farm’s dam, helping to generate clean energy, while also minimising evaporation from the farm’s dam and saving valuable agricultural land. The system is the first commercially operated floating solar system on the continent, and at 60kWp, it is also the largest. The first phase of the project, which also includes a land-based solar installation on the farm, will allow the farm to run 90% of its energy intensive cold storage, irrigation and wedding venue facilities off of the traditional electricity grid. A second phase which will see the installation of battery packs, will remove them from the grid completely. Boplaas 1743, which owns and operates the farm, is one of the oldest family owned businesses in the country. Financial director Carl van der Merwe said the installation would reduce their carbon footprint by half. With rising electricity prices, and uncertainty around Eskom, the family made the decision to invest in solar. GreenCape, the Western Cape Government's partner in developing the green sector, has also just published a brief on the solar industry, highlighting the various financing and incentive options available to businesses who are considering solar PV as an option. Picture caption: The floating solar PV system installed on a dam at Marlenique helps to prevent evaporation and saves land for agricultural use.